It always amuses me a little when people try to hide their confusion when I tell them I am a canine nutritionist. I can see them trying to figure out if they heard me correctly, whether I’m joking or if I perhaps only work with wealthy celebrities. I work with all sorts of clients, including those on a tight budget. Adding freshness to your dog’s diet doesn’t have to come at a high cost and can make a huge difference to their quality of life. Why feed a home-prepared diet? One of the most common questions I’m asked about my work is why people seek out my services. There are, after all, thousands of dog food brands on the market so why would someone need a nutritionist for their dog? Hasn’t all the work already been done? Some people simply prefer to cook for their dogs. In the same way that some people prefer to buy organic produce because they want to ensure there are as few additives in the food as possible, some people want to make sure that the food their dog is being fed is free from the by-products and chemical additives found in many commercial foods. And as I mentioned in a previous post on dubious dog food claims even if a commercially produced dog food says it’s “organic” or “uses organic ingredients” you still may not be getting what you imagine your getting. The only way to really know what your dog is eating is to make it yourself. For other dog owners necessity is what is driving the need for a home-prepared diet. Some dogs have special dietary needs that make commercial food selection difficult or impossible, such as certain combinations of disease. Some find that their dog won’t eat the prescription food offered by their vet to help treat the disease, the prescription food is just too expensive long term or their dog just eats better when they are offered a fresh homemade diet. Whether you have a fussy eater, a dog with a sensitive stomach or who has lost their appetite due to illness, a home-prepared diet is often much more palatable and can help improve their health and quality of life. The third reason for a home prepared diet is for performance. Often the owner of performance or working dogs feed a home-prepared diet rich in fat and protein to maintain peek condition and fitness. The elevated nutritional requirements are simply not met in commercial food. Do vets recommend home-prepared diets? Yes and no! It depends on the vet and the circumstances. A proper home-made diet requires a lot of work to get right. It must be prepared properly and include the right vitamin and mineral supplements. Other supplements such as fatty acids may also need to be added. Most people won’t do the research or talk to an expert before trying to make the food themselves. In these cases the dogs may end up with nutritional deficiencies. And many of these deficiencies aren’t obvious. It may be many months or even years before the owner notices a problem by which time it may be very hard to fix. 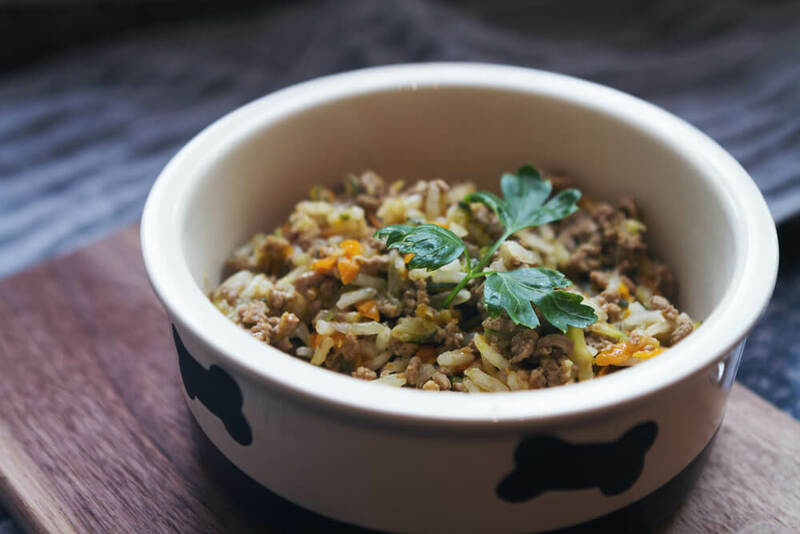 If you are considering a home prepared diet for your dog it’s therefore absolutely critical that the home-prepared diet is balanced and fully meets the needs of your individual dog. How do I prepare a home a home-prepared diet? If formulated by a professional making a home prepared diet is very simple. The recipe will provide clear instructions and the amount of foods and supplements that need to be fed to your dog each week. My recipes give the weekly amounts to be fed. Simply mix all the ingredients together well and divide the batch into 7 equal portions. Multiply the amount of each batch to cook for more weeks in advance, freeze down and defrost through the week as needed.